Altec Electronic Systems :: High Definition Displays. Do you enjoy watching TV but have a burning desire to feel like you are a part of the program that you are watching? Altec Electronic Systems can make this desire of yours a reality. Here at Altec we employ the most knowledgeable staff that can answer all your questions about High Definition displays, whether it is about TV�s, cable or satellite. We will equip your home with the latest technology in High Definition viewing. Digital entertainment: The widescreen, is better for viewing DVD movies because it is Hollywood' format of choice. Digital photography: A widescreen is better for viewing panoramic pictures and it also allows more thumbnails to be displayed on the screen. Games: High-resolution game applications can display more-realistic characters on a high-definition widescreen. This can make you feel like you are really a part of the game experience. Enhanced productivity: High resolution supplies more screen room so you can fit more windows side by side without overlapping, and spend less time scrolling between windows.
" 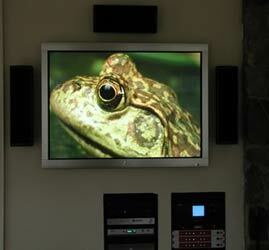 Call Altec Electronic Systems today to start plans for your High Definition Displays. "